In the past children born out of wedlock got a lot of attention (mostly negative). They already had been visually separated in registers from their coevals. An entry of a father’s name was often left blank, or the entire line was written all over, if they were later acknowledged. Before some parts of the legislation were changed in 1784 and 1787 illegitimate children had been inscribed in the last part of the register book, or they even had a special book, which was called the “liber arcanus”- “the book of secrets”. After the changes in 1787 they were written in a register together with other newborns. A name of the mother was obligatory; if nobody was recorded as parent, a child was probably marked as a foundling. Registrars were often guessing the names of foundling’s parents. The birth of a child (by the act from years 1870 and 1881) should be declared by a legitimate father and a midwife. In the case of illegitimate children procedure was somewhat different. For the mother of an illegitimate child was not required to indicate the name of the child’s father. In the book the father was entered only if the priest and godparents confirmed that the father is present and that he admitted paternity. Midwives and obstetricians had been required to notify the head of registers all of what they knew about the name of the mother and her wedding. They had to be careful at giving information, because registrar had the right to verify their degree, if they gave suspicious arguments. In the case of lies midwives could lose their job. Before enrolling the registrar also had to determine whether a person is really the mother of the child, or is she telling the truth about her name and whether the child’s father is for seven months a legal husband of the mother. If they were not yet married for six months, the father had to confirm the legitimacy of the child. In the past there was another provision. Those children, who had been born 300 days after the divorce or the death of a father, were also considered as illegitimate. 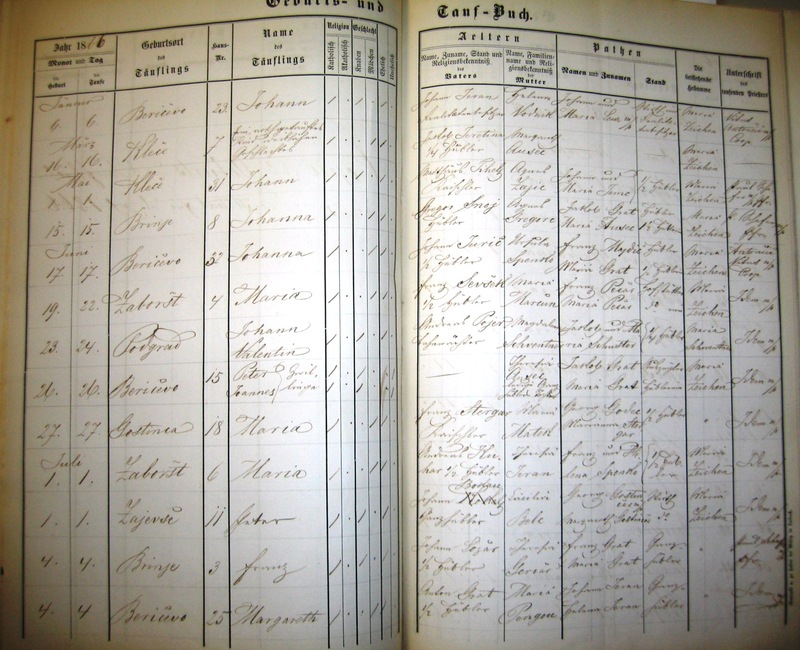 Genealogical researches, which we are making, give us a lot more than just dull data about the date of birth. From the content of the record, you can see what kind of a life the individual lived. Many data had been, often in the case of illegitimate children, entered later. When they were grown up, they could request or verify paternity. Names usually were not allowed to be changed, but they may have changed their religion, but under certain conditions. Children younger than 7 years changed their religion along with their parents. Change of the religion was impossible between the age 7 and 14, when children had free choice of religion according to their own consideration. Umek, Ema in Janez Kos. 1972. Vodnik po matičnih knjigah za območje SR Slovenije. Ljubljana: Skupnost arhivov Slovenije.